This dish will lend itself as a side dish or a breakfast dish if you choose to add some extra ingredients. As a side dish it would compliment Kotletton/Kotlety well. If you are considering this dish for breakfast you could add a layer of cooked sausage on top of the tomatoes and then top the egg mixture with some grated cheese. I’ll leave that to your discretion and not add those ingredients to the recipe. Melt the butter and Olive oil in a large pan. Saute the onions with the sugar until they are golden. Remove the onions from the pan leaving behind as much of the oil/butter that you can and set the onions aside. Pour the 2 tablespoons of lemon juice over the onions as they sit. Add the washed and cubed potato to the same pan and fry them until they are golden turning occasionally. You might need to add a little extra oil to the pan before you add the potatoes if the onions absorbed too much of the grease. When the potatoes are golden arrange the tomatoes on top of the potatoes. Add the onions on top of the tomatoes. Sprinkle with the salt and pepper. Cover and let simmer on low heat for 10 minutes. Beat the eggs with the 1/4 tsp. salt. Pour the eggs over the vegetable mixture in the pan. Cover and let cook on low heat for another 10 minutes or until the egg is set. This is a bit like a fritatta - I love the idea of using it as a side dish for something other than breakfast. This looks like my kind of dish. 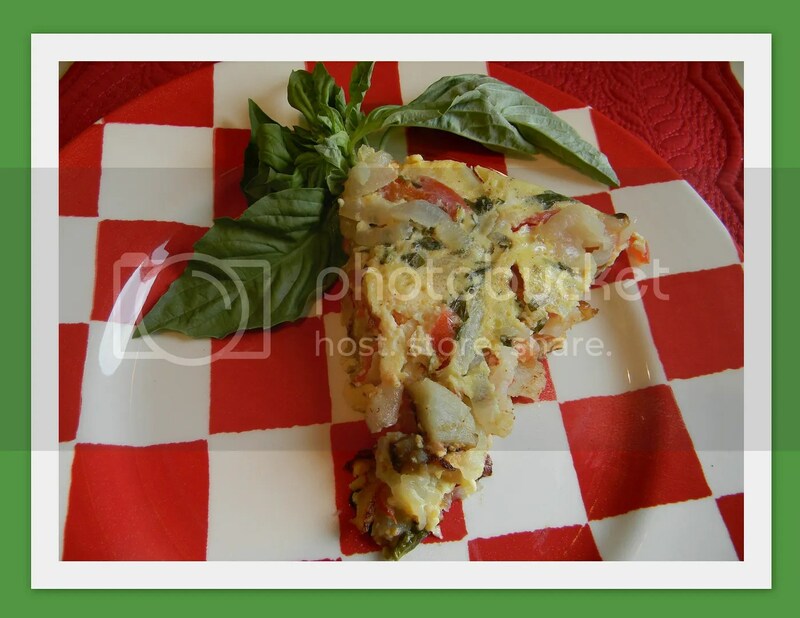 Potatoes, eggs,tomatoes and basil are the perfect combo! And I wouldn't mind the plate you serve it on as well. This is how I make my fritattas... on the stovetop covered. Love potatoes in them. oh it looks perfect for a lunch idea. Thanks Ellen. It reminds me of a Spanish tortilla.